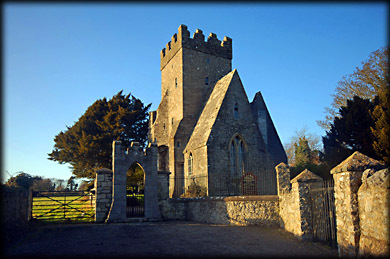 St Doulagh's Church is notable as the oldest stone-roofed church still in use in Ireland. The medieval church is on the site of a small monastic settlement founded by the Saint in the early 7th century. As an anchorite /hermit, it is believed St Doulagh lived in a cell with minimal contact with the outside world. The 12th century church was built as a hermitage, and includes a Hermit’s Cell, measuring 10ft. by 7.5ft. Other stone roofed churches can be found at St Kevin’s Glendalough and Cormac's Chapel in Cashel. The original portion of the building is 48 feet by 18 feet, with a double roof of rough stone set with cement. The original walls are three feet thick. 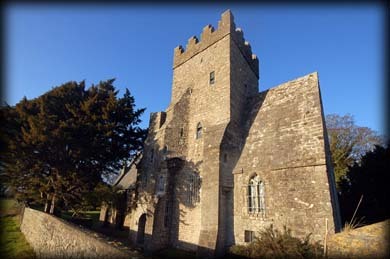 The battlemented square tower was added in the 15th Century. There are seven rooms altogether in the church, including a leper’s window, through which the unfortunate victim was permitted to receive Holy Communion and a penitential cell where the incumbent languished until he changed his ways. The church has undergone many alterations over the preceding two centuries and there are many conflicting opinions regarding unraveling its complicated building history. 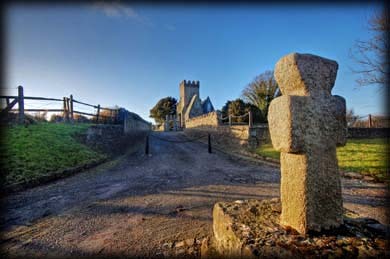 At the entrance to the church grounds stands a granite cross. The use of granite may suggest a pre-1300 date for the stone. The cross is plain but the upper part has a suggestion of Maltese design and the shaft is also wider at the base. Close by the church is a baptistry, also known as St Doulagh's Well, over which rises an octagonal building. The well is unique in that it is the only surviving detached baptistry in the country. In 1609 the inside was covered with frescoes on the ceiling and walls, including images of St Patrick, St Bridget, St Columcille and St Doulagh dressed as an anchorite. No trace remains as they were destroyed by Sir Richard Bulkeley of Dunlavin on his return from the Battle of the Boyne. Adjacent to the octagonal baptistry is an open-air pool with stone seating, known as St Catherine's pond. The well was widely known for the curative effects of its water and patterns were held here until rioting started. The patterns were finally suppressed by the clergy in the 19th Century. Situated: From Dublin take the R105 towards Howth. After 1 kilometre turn left onto the Malahide Rd / R107. Then travel for 7 kilometres and you will see St Doulagh's Church set back from the road on your left hand side. The Church is occasionally open for tours on Sunday afternoons during the summer months. Discovery Map: 50. O 2105 4210. Last Visit Jan 2010.